WEEKLY BEACHSIDE VACATION RENTAL. 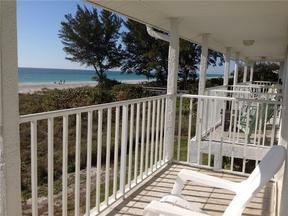 Gorgeous views in this updated, turnkey furnished Gulfside unit with direct beach access. Small, quiet, 2 story, 8 unit complex. Direct Gulf front unit with unobstructed views. Unit sits on the second/top floor and directly overlooks the beach and water/Gulf of Mexico. Balconies from both the living area and master bedroom. Full Gulf view. King and double bed; flat screen TV, with WiFi Internet access, 2nd floor unit accessed by stairs; wood floors throughout. Light and bright interior; end unit with extra windows. On-site laundry facilities. Enjoy spectacular sunsets from the balcony! Walking distance to Joan Durante Park, shopping and restaurants. Weekly rental is $1,661/week Total mid-April to mid-December.